Esyllt Jones and Adele Perry, eds. 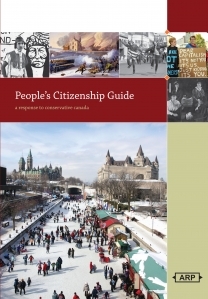 People’s Citizenship Guide: A Response to Conservative Canada (Winnipeg: Arbeiter Ring Publishing, 2011). I was asked to write a review of the People’s Citizenship Guide as someone who has fairly recently taken the Canadian citizenship test, and not as the historian I am. It is extremely difficult to separate these two identities, but I will do my best to write as a mere mortal, rather than as an historian. As the subtitle reveals, the People’s Citizenship Guide was designed out of a reaction to the Conservative government’s new citizenship guide. The authors do not claim that their version of Canada is the one true version, rather they are challenging the one version presented in the current study guide for Canadian citizenship (pp. 5-6). They hope their guide causes those who read it to think about “what it means to be a citizen of Canada” (p. 6). The guide’s layout and design is similar to the government’s citizenship guide, with similar topics and subheadings. For example, there are sections on “Oaths, Citizenships, and Canadas,” “Who We Are,” and Canada’s “Symbols,” “Economy,” and “Regions.” And like the official guide, the People’s Citizenship Guide is appropriately illustrated on each page to match the textual content and is approximately the same length. However, I am not sure if the People’s Citizenship Guide could be used as a guide for Canadian citizenship. If a non-conservative government chose to use it, they would have to go beyond the authors’ depiction. There would have to be an added section on the importance of – or even the duties, rights, and responsibilities of – new citizens to make Canada a better, more equitable place. As an historian, I have few qualms with this booklet because it draws upon work many in the historical profession have been doing regarding colonialism, race, ethnicity, gender, class, and nationalism. But as a new citizen, I need a more positive framing and a greater call for engaged citizenship if Canadian citizenship is to have the meanings the authors imply it should. In short, if an immigrant comes from a place overwhelmingly less hospitable (think forced migrants from a brutal dictatorship), it is hard for him or her to see any relevancy of the current and past Canadian injustices. However, if that same immigrant can see that he or she can contribute in a way that marginalized groups and individuals have in the past – that struggling for something better is Canadian – then perhaps this booklet plants the seeds of a new citizenship. What is more, I do not see any more ease or difficulty for permanent residents studying to pass a test on this material versus the current citizenship test guide. No doubt the People’s Citizenship Guide is completely different from the guide of the test I took. However, prospective citizens probably need both versions and other versions (as the authors indicate) to gain a good understanding of Canada. In my mind, a prospective citizen needs to know the history presented in this guide as much as the fact that there are people in Canada who have “a monolithic view of Canada that excludes whatever facts and experiences complicate its nostalgia for a simple past that never really was” (p. 6). There is nothing wrong with putting people at the centre of Canadian citizenship, but as the authors indicate on page 61, it is not clear Canadian citizenship is more important to most Canadians than other identities such as regional identities. Yet neither the People’s Citizenship Guide nor the current citizenship guide address the ultimate problem: citizenship is taken for granted by most of those born into it and the native-born are not required to take a citizenship exam to prove their knowledge. Unfortunately, too many native-born citizens I have met would not pass the “Conservative Canada” citizenship test or a similar test on the People’s Citizenship Guide. Thus, as hard as I tried, and like the authors in some ways, I am left with an historian’s lament: if only the people, the majority of native-born and naturalized citizens, would read and engage with, and debate publicly the People’s Citizenship Guide; and for that matter, the current citizenship guide alongside it as well. E.L. Payseur is a naturalized Canadian citizen.